When itâ€™s time to spend quality time with a loved one this winter you can fall back on the usual date options of dinner and a movie or you can show that you are the Don Juan of the arctic with todayâ€™s Alaska Rewards offer. Take your love one on the perfect date or a unique way to propose to the love of your life with Horse Trekkin Alaskaâ€™s sleigh ride! 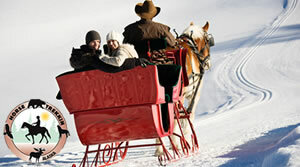 For $145 get a half hour romantic sleigh ride for two in Anchorage. Which includes hot beverages that will go great as you sit around the fire pit followed by your choice of chocolate fondue with fruits and crÃ¨me puffs or cheese fondue with soup. Plus, youâ€™ll receive a gift certificate from Horse Trekkin Alaska for an identical package your friends or family will relish as a gift from you. Add up to 3 additional people to either package for an additional $15 per person. Enjoy a quiet sleigh ride together and fall in love with todayâ€™s Alaska Rewards offer from Horse Trekkin Alaska. Limit 1 per person. Reservations are required. Must be used in one visit and no cash value or cash back. Gratuity is not included. This deal cannot be combined with any other offer. Bonus gift certificate can only be used between Jan 1st â€“ Mar 15th 2012.